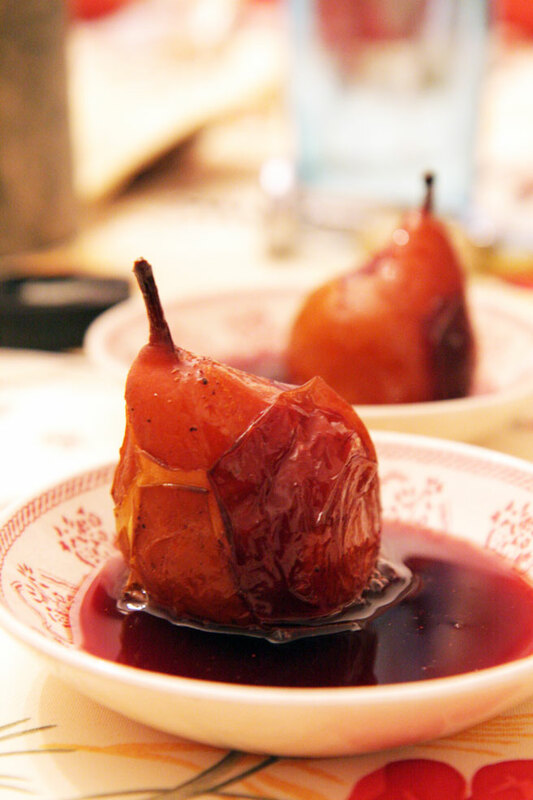 Christmas made easy: Winter pears simmered in wine, served after a simple meal with gathered family. While we still have a few days 'till Christmas, we want to rev up the holiday now! This is an easy dessert to put together one afternoon and put aside to chill, soaking in their syrup. Choose pears that mature in the winter for this recipe, like Bosc. This recipe fills the house with the perfume of the holiday, so now is the perfect time. They cost pennies a person. No special shopping for this recipe. The hardest thing is washing the pears. With poached pears, simple is best. Adding long lists of ingredients may add a strange je ne sais quoi, but that's not what we look for in our poached pears. These are a kind of gift from heaven, so simple, delicious, and satisfying. About the pears: Right now in France we have the winter pear called Martin Sec, which is a wonderful cooking pear, because their texture and flavor when cooked stays firm, smooth and sweet. They retain their body when simmered in anything from caramel to wine. If you don't have Martin Sec, a Bosc is perfect. Wash the pears thoroughly. Nestle them into a pot that has a cover. Add the wine, and bring it to a boil. Mix the sugar and cinnamon together, and sprinkle it over the pears in their bubbling wine. Let that roll at a full boil for 4 minutes, then top off with water to cover the pears by 2/3. Bring to a boil again and reduce the heat to low and simmer, covered, for 15 minutes. Remove from the heat, let cool to room temperature, then refrigerate, in their liquid, for as long as 3 days. Serve cold, with their syrup. You can make a batch of these and have them on hand as a dessert choice at family gatherings. This is going to be a very cheesy Christmas! Everybody thought the same thing and brought cheeses this year! I gathered some from the Alps and the Lyonnais region, and presented them to Brigitte. This was when I heard that Aude and Seb had done the same thing with cheeses from the Auvergne! This means the cheese plate is going to be the best it has ever been, I think. Those look good. I have been meaning to try poached pears for a while. They're a favorite winter dessert of ours as well. Love this! Gorgeous photo too! I am quite envious of your Very Cheesy Christmas! Greetings to you and yours. Enjoy your Christmas and enjoy all the cheese! I'm in charge of putting together a cheese platter for our Christmas dinner. A job I am happy to do! Poached pears and French cheese... Can I come? The poached pears are beautiful and look delicious. i am making a fatty carrot cake for Christmas Eve. Right now I have a beautiful chicken soup cooking and the aromas of garlic, onion and bay leaf fill the air on a VERY frigid December morning. Maybe I'll poach some pears for dessert tonight. Joyeaux Noel tous! I've actually been thinking about poaching pears for a while now (since I read a recipe for that in The Foodies Kitchen) but poaching is one of those things that I finally built up the courage to do. Nothing is more dissapointing than to spoil some great pears! I think this time I'll give it a shot though. It seems pretty straight forward and I've had some pretty decent succesess with poaching so that, I believe, makes for a great time to give this a shot! The cheese however (oh cheese), is another story. I've always wished I would try cheese and like it but I just can't seem to get there! Everytime I try it my palette just rejects it. I love the look of cheese, I love the descriptions, the variety and the IDEA but somehow I just haven't been able to like the taste. Maybe a happy compromise will be to find a bunch of cheese-loving friends and have them over for a cheese tasting just so I can go and indulge in the joy of choosing and preparing the cheeses even if I can't enjoy the eating of them! That sounds like a great idea, Seth.